This is the 145th issue in the New Directions for Evaluation series from Jossey-Bass. It is an official publication of the American Evaluation Association. James W. Altschuld, PhD, is Professor Emeritus at The Ohio State University where he taught program evaluation, needs assessment, and research methods. He has published and presented extensively in the field of evaluation particularly with regard to how needs are assessed. 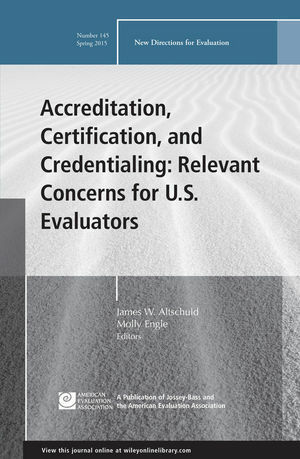 Molly Engle is the editor of Accreditation, Certification, and Credentialing: Relevant Concerns for U.S. Evaluators: New Directions for Evaluation, Number 145, published by Wiley. The authors provide an overview of the development of the field of evaluation during the past 40–50 years with implications pertinent to accreditation, certification, and credentialing. This chapter contains a description of key terms related to competencies, current work going on in studying them, issues for consideration, and use of the skills in the evaluation field. In this chapter are a review of trends in evaluation education programs, recent advances in the professional preparation of evaluators, and a discussion of future research on key topics in evaluation education. Using business management, accounting, and human resource development as examples, the accreditation of institutions or programs offering evaluation education is thoughtfully examined. The rationale for the Canadian system and how it came into being (the forces that shaped it, what it looks like, how it functions, issues, and other aspects) are the main topics covered. This chapter analyzes the results of a survey of AEA members within the United States regarding the feasibility, need, and potential for certification or credentialing in the future. This chapter is a synthesis of the prior ones with a careful look at the evidence about whether accreditation, certification, or credentialing improves the evaluation of programs or projects.